Info from the DailyDot.com! These shoes are pretty interesting…… check them out below! When U.K. company Irregular Choice collaborated with Disney for a Star Wars shoe collection, the result was a stunning line of flats and heels that included flashing lightsabers. Now Irregular Choice is releasing a second line in partnership with Disney that takes inspiration from the classic animated film Alice in Wonderland. It’s a whole different world that fits particularly well with the company’s style. Irregular Choice announced the upcoming limited-edition collection in January, and—as it did with the Star Wars line—has been releasing teaser images ever since. Dan Sullivan, Irregular Choice owner and main designer, told the Daily Dot in an email interview that the company has received requests from customers for an Alice in Wonderland line in the past. “Alice does have an amazing cult following, but whilst not being as big as Star Wars around the world, we are confident in our fans desire for it and that of many other ladies whose hearts the story has touched,” he said. 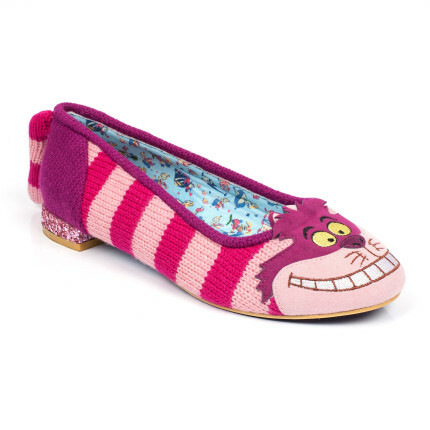 The collection will feature a mix of flats and heels showing familiar characters like Alice, the Cheshire Cat, and the Mad Hatter as well as imagery and quotes from the original 1951 film. Despite the collection’s release before Disney’s Alice Through the Looking on May 27, imagery from the live-action movies is not featured in the line. “Disney wanted us to do the classic movie, and it is very important that you do not cross reference between the film/books etc. We had to be true to the original film only,” Sullivan said. Disney provided assets from the animated film for Irregular Choice to use. You can see more photos of the Alice in Wonderland collection below. The prices on these intricate shoes will range from $184 and $381. A launch event on Feb. 26 in London will mark the release of the line, which will be available at select stores and the company’s website!